Group collects nomination forms for Buhari – Royal Times of Nigeria. The Consolidation Ambassadors Network (NCAN), a pro-Muhammadu Buhari, group on Wednesday obtained the presidential election nomination forms on behalf of the president who is currently in China for NCAN, Buhari group pays fourty-five million naira for nomination forms. 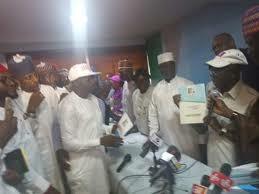 The group paid the mandatory fourty-five million naira for the expression of interest and the nomination form.